Contents Includes one 22" x 24" x 5" (Economy or Rolling) Springer Sign Base, two no slide fleet, and one set of assembly hardware. 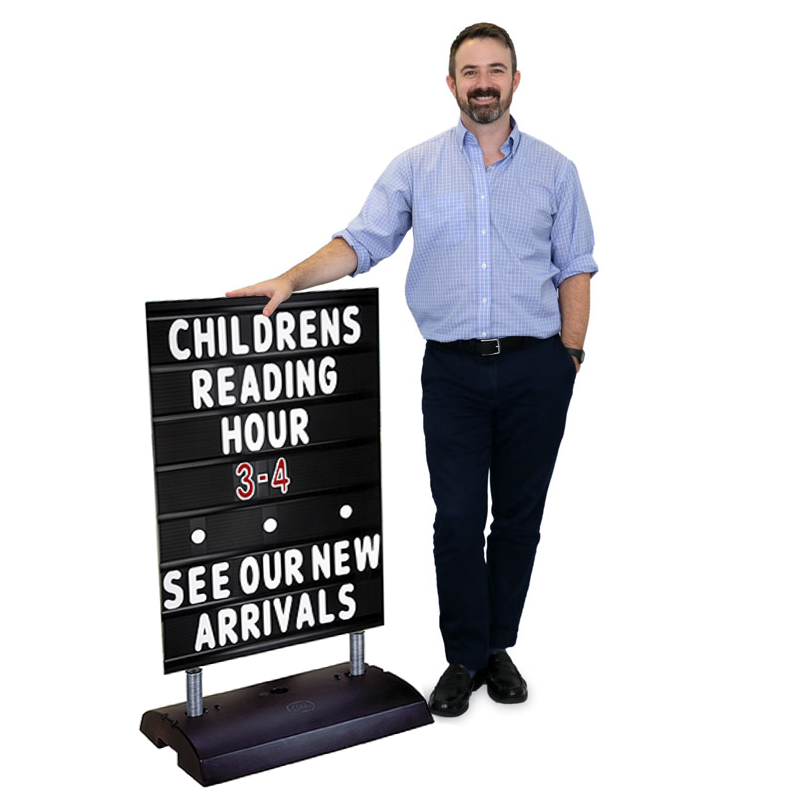 The STANDARD version comes with one - 24" x 36" x 0.5" (600 x 900 x 10mm) black message board with 7 letter tracks on both sides and one set of 314 - 4" letters, numbers, and symbols (white letters & red/white numbers). 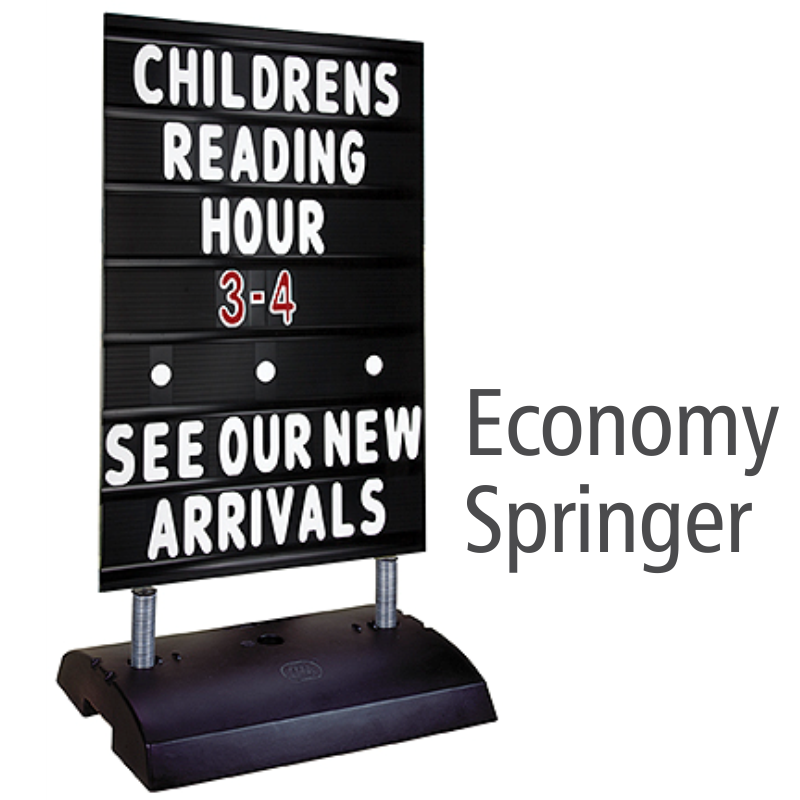 Economically priced when compared to other sidewalk signs, the Springer was designed with portability in mind! 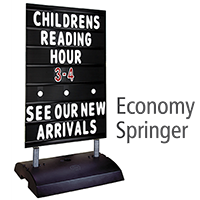 The lightweight, low-profile construction allows you to move the sign where it is most effective visually. • Comes with a customizable message board allowing you to create range of advertisements, messages or a sales pitch. • The anti-slip feet keep the sign holder firmly in place when on the sidewalk. • Heavy-duty springs keep the sign in place in 40+ mph winds! • For added stability in windy conditions fill the ballast port (located in the middle base) with water or sand. • Comes with a large assortment of letters, numbers and symbols, please see contents for details. • Available in a budget-friendly economy version or ultra-portable model with wheels & storage handle. Made from rustproof plastic technopolymers resistant to adverse weather conditions and environments. Steel springs and support rods divert 40+ mph winds and are designed to gently sway back & forth in the wind. The base has a built-in ballast port with a 1.5 gallon capacity for added stability, capable of accepting water or sand. 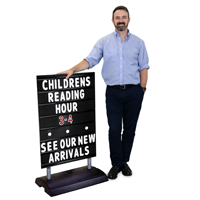 Accepts any 10mm (3/8") thick message board or corrugated plastic sign with vertical orientated flutes. Recessed wheels are suspended above the ground and can be employed by tipping the base or using the E-Z lift handle enclosed within the base.